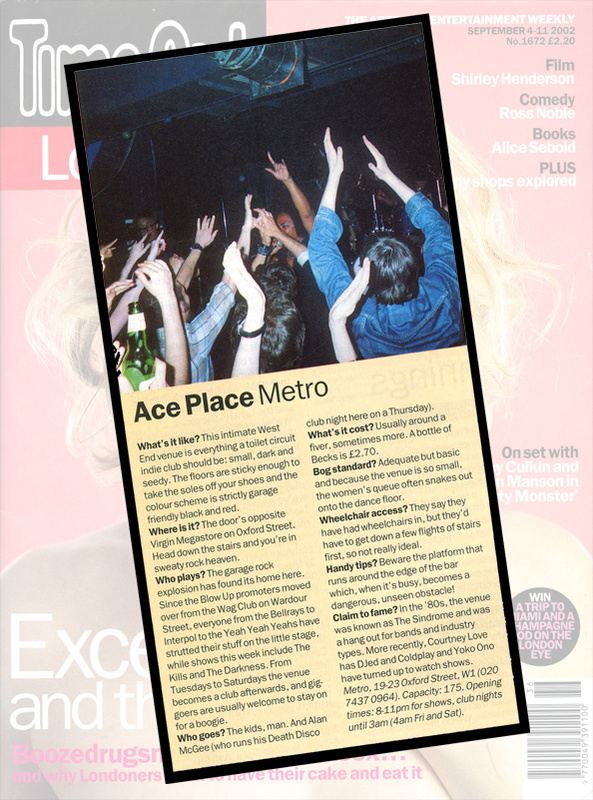 ACE PLACE: METRO What's it like? This intimate West End venue is everything a toilet circuit indie club should be: small, dark and seedy. The floors are sticky enough to take the soles off your shoes and the colour scheme is strictly garage friendlyblack and red. Where is it? The door's opposite Virgin Megastore on Oxford Street. Head down the stairs and you're in sweaty rock heaven. Who plays? The garage rock explosion has found its home here. Since the Blow Up promoters moved over from the Wag Club on Wardour Street, everyone from the Bellrays to Interpol to the Yeah Yeah Yeahs have strutted their stuff on the little stage, while shows this week include The Kills and The Darkness. From Tuesdays to Saturdays the venue becomes a club afterwards, and gig-goers are usually welcome to stay on fora boogie. Who goes? The kids, man. And Alan McGee (who runs his Death Disco club night here on a Thursday). What's it cost? Usually around a fiver, sometimes more. A bottle of Becks is £2.70. Bog standard? Adequate but basic and because the venue is so small, the women's queue often snakes out onto the dance floor. Wheelchair access? They say they have had wheelchairs in, but they'd have to get down a few f I ights of stairs first, so not really ideal. Handytips? Beware the platform that runs around the edge of the bar which, when it's busy, becomes a dangerous, unseen obstacle! Claim to fame? In the '80s, the venue was known as The Sindrome and was a hangout for bands and industry types. More recently, Courtney Love has DJed and Coldplay and Yoko Ono have turned up to watch shows. Metro, 19-23 Oxford Street, Wl (020 74370964). Capacity: 175. Opening times: 8-llpm for shows, club nights until 3am (4am Fri and Sat).